Post No Bills Fun Pack - ZineWiki - the history and culture of zines, independent media and the small press. 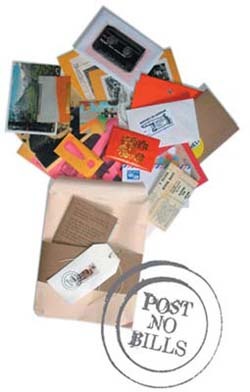 The Post No Bills Fun Pack was a publication made in 2006 by Emma Davidson and Anwyn at the conclusion of the Post No Bills project, an Australian mail art and letter writing network. Participants in Post No Bills exchanged materials via a physical mailing list which was updated and maintained by the facilitators (Anwyn and Emma). After a period of twelve months they were invited to return materials to the facilitators, who then compiled the Fun Pack. Originally, the outcome of the project was to be the production of a zine or more conventional publication that would document some of the postal exchanges. Ultimately it was not felt that such a format would be sympathetic to the highly tactile nature of the materials that actually emerged from the project, and so the Fun Pack was born. The Fun Pack consisted of contributions from participants, including letters, small paper-based art works such as collages, zines, postcards, mix tapes and cds. These were reproduced as closely as possible to the originals (tracklistings only, in the case of music mixes) with colour and black and white photocopies and a wide variety of paper stocks and envelopes, which were then presented in a single larger envelope as an edition of 150. The Post No Bills Fun Pack was launched as part of the official program of the 2006 This Is Not Art (TINA) festival in Newcastle, Australia. This page was last modified on 16 September 2010, at 13:55.